USA TODAY BESTSELLING AUTHOR and AGATHA AWARD-WINNING SERIES "Boyer delivers a beach read filled with quirky, endearing characters and a masterfully layered mystery, all set in the lush lowcountry. Don't miss this one " - Mary Alice Monroe, New York Times Bestselling Author of A Lowcountry Wedding "Boyer writes with humor, grace, and Southern grit in this charmer of a Carolina tale." - Gretchen Archer, USA Today Bestselling Author of Double Knot "The authentically Southern Boyer writes with heart, insight, and a deep understanding of human nature." - Hank Phillippi Ryan, Agatha Award-Winning Author of What You See "Boyer deftly shapes characters with just enough idiosyncrasies without succumbing to clich's while infusing her lighthearted plot with an insightful look at families." - Oline Cogdill, South Florida Sun Sentinel Somebody pushed Shelby Poinsett out her second-floor library window and it wasn't her husband. At least that's what Charleston's most prestigious law firm wants Liz Talbot to prove. Liz must run the spectrum of Southern society, from the local homeless shelter where Shelby volunteered to the one-hundred-year-old book club where Charleston's genteel ladies are dying to join, to bring a killer to justice. Related subjects include: women sleuths, private investigator mystery series, cozy mysteries, murder mysteries, whodunit mysteries (whodunnit), book club recommendations, Southern fiction, Southern humor, Southern living. Books in the Liz Talbot Mystery Series: - LOWCOUNTRY BOIL (#1) - LOWCOUNTRY BOMBSHELL (#2) - LOWCOUNTRY BONEYARD (#3) - LOWCOUNTRY BORDELLO (#4) - LOWCOUNTRY BOOK CLUB (#5) Part of the Henery Press Mystery Series Collection, if you like one, you'll probably like them all... 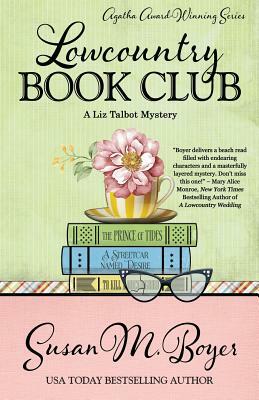 Author Bio: Susan M. Boyer is the author of the USA Today bestselling Liz Talbot mystery series. Her debut novel, Lowcountry Boil, won the Agatha Award for Best First Novel, the Daphne du Maurier Award for Excellence in Mystery/Suspense, and garnered several other award nominations, including the Macavity. The third in the series, Lowcountry Boneyard, was a Southern Independent Booksellers Alliance (SIBA) Okra Pick, a Daphne du Maurier Award finalist, and short-listed for the Pat Conroy Beach Music Mystery Prize. Susan loves beaches, Southern food, and small towns where everyone knows everyone, and everyone has crazy relatives. You'll find all of the above in her novels. She lives in Greenville, SC, with her husband and an inordinate number of houseplants.